As in Rheumatoid arthritis, ankylosing spondylitis (AS) is a generalised chronic inflammatory disorder, which mainly involves the sacro-iliac joint (SI) and the spine. Typical presentation will be recurrent back pain and stiffness, with variable involvement of the shoulder, hip and other peripheral joints. It's a male predominant disease (9:1), which typically affects teens and young adults aged between 15-25 years old. There is a strong familial aggregation and the genetic marker for AS is HLA-B27. Disease process usually started over the SI joint, followed by the lumbar spine. The hip, knee joint and the manubrium sterni are commonly involved as well. Initially, there is inflammation of the synovium (synovitis), followed by articular cartilage damage and bony destruction. Healing process take place initially by formation of granulation tissue, later by fibrosis, and lastly, ossification of the fibrous tissue. Bony fusion (ankylosis) in between the vertebra can occur with the formation of bony bridges known as syndesmophytes, resulting in a rigid and stiff spine. 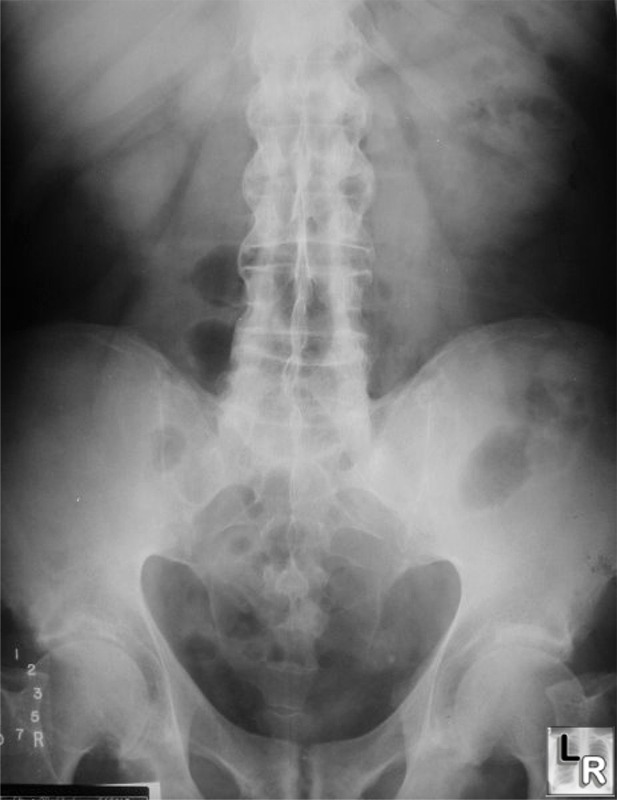 Typically a young male, presented with recurrent back pain and stiffness at regular interval over many years, which has been misdiagnosed as having 'back-strain'. The major difference between back strain and AS is the symptoms commonly worsens during early morning (after waking up) and after inactivity of the back. Sometimes, patient also complains of 'sciatica', which can be mistreated of having prolapsed intervertebral disc. These symptoms gradually becomes more continuous over a period of time, with other general symptoms such as general fatigue, pain and swelling of other peripheral joints, intercostal pain and tenderness sets in. In about 10% of the cases, the presentation can be atypical, especially in women. It started with peripheral joint involvement, with pain/swelling of the ankle joint or pain/stiffness of the hip, then gradually the back pain sets in after many years. Atypical presentation is the commonest cause that AS has been misdiagnosed. At early stages of the disease, there's flattening of the lower back, and limitation of spinal extension. Diminished extension of the spine is the earliest, and yet the most disabling lost of spinal movements of all. Tenderness over the spinous processes of the vertebrae and over SI joints can be elicited. In a well-established AS, diagnosis is usually easy. There's lost of lumbar lordosis with increased thoracic kyphosis, and a forward thrusting of the neck. While standing, to maintain the upright posture, the patient has to flex his/her hip and knee joint slightly, and eventually, it turns to be a fixed flexion deformity. Reduced chest expansion (less than 5cm) may be seen due to the thoracic spine involvement. Cervical spine involvement can be tested by Fle'che test. As the patient is asked to touch the wall using the back of his head, he/she is unable to do so. A test to detect any musculoskeletal abnormalities and chronic inflammation involving the lumbar vertebrae and SI joint. Over the normal side, both hip and knee are fully flexed, with the affected hip placed over the edge of the examining couch. By hyper-extending the hip over the affected side, which causing pain over SI joint - test is considered positive. b) Pump-handle test : Both knee and hip joints are fully flexed, while forcing them towards the chest and opposite shoulder, Pain felt over SI joint means test is +ve. Place your measuring tape over the dimple of venus, at the level of L5 (PSIS), and the other end of the tap 15cm above vertically. Ask the patient to bend forwards and if the increased in the length is < 5cm, this test is positive. There might be features of inflammatory arthritis, with swelling, tenderness, effusions and lost of mobility over the peripheral joints. Extra-articular involvement : General fatigue and weight loss is the commonest. 25% of the patient may be having acute anterior uveitis, which without treatment may complicate as glaucoma. Others like carditis, pulmonary fibrosis (at apical region) and aortic regurgitation are usually late features. There may be hepatosplenomegaly due to amyloidosis. 3) Hyperkyphosis : As the disease progresses, the kyphosis can be severe until the extent that the patient is unable to see what's in-front of his feet. X ray pelvis AP view and lateral view of dorso-lumbar spine is required. The patient has to adopt an active lifestyle to reduce the stiffness of spine. They can be taught spinal extension exercises, eg : swimming, dancing, or gymnastics are helpful. To adopt a correct posture while standing and sitting is also important. Analgesics, like NSAIDs can be given to reduce associated pain, so that the patient can maximise the benefits from the above exercises. For severe spinal deformities, spinal osteotomy can be done.